Stochastic signal, moving averages and MACD in one indicator. 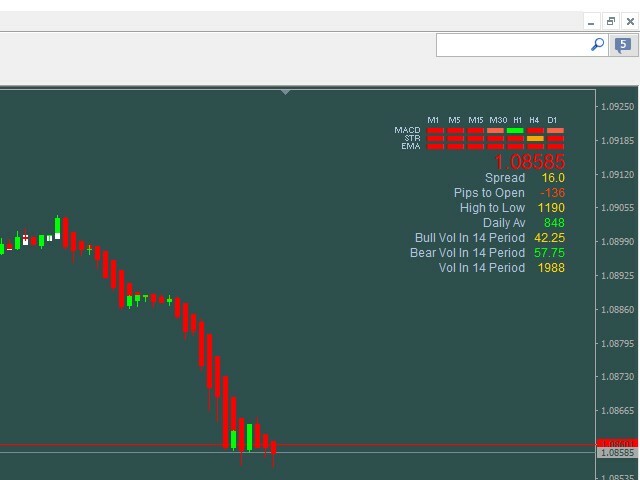 The indicator also shows the current price, the spread of the broker, the amount of pips of the day, the day volume periods, buying and selling volumes. Shift_UP_DN=0 - distance indicator on the top. BarLabel_color=LightSteelBlue - window text color. CommentLabel_color=LightSteelBlue - window text color. Corner_of_Chart_RIGHT_TOP=true - indicator position on a chart. Sangat membantu dalam menentukan arah trend selanjutnya. nice details show in the chart and can be useful.